We could set up a spawner to create a load of monsters for us, but we'll use a timeline instead. A timeline can issue commands. Our timeline will simply issue the same create object command over and over in a loop. 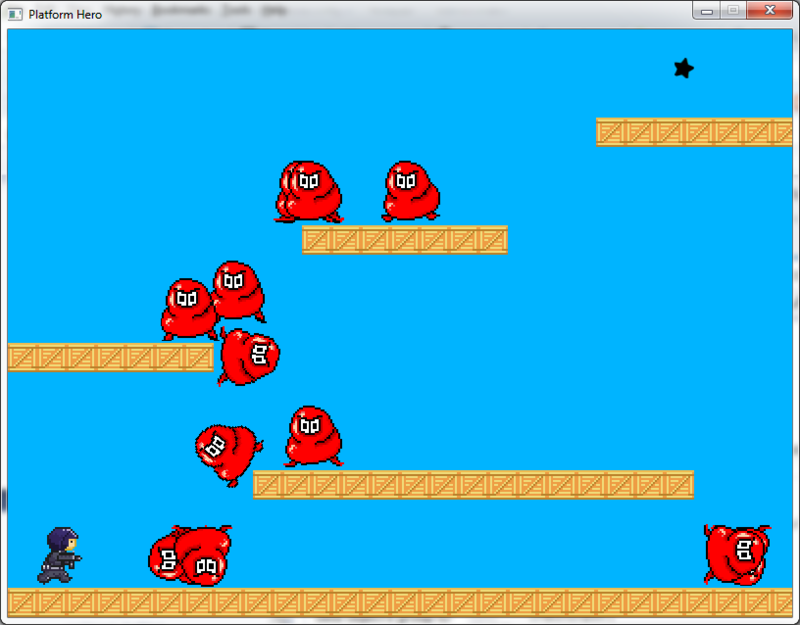 The Speed on the object will give the monsters a little random left/right movement. The Friction on the bodypart will make the monster less slippery on the ground. The LinearDamping on the body will slow him down a little over time if he's too fast. The high AngularDamping will ensure the monster tips over the edge but not rotate and tumble wildly. Finally, a touch of Restitution on the body will allow it to bounce just a touch when landing from a height. That should work a little better. Next: Part 18 – Exploding Monsters. Part 15 – Collision Events. Part 19 – The Hero's survival.